Holi Pournima, also called as Phalgun Pournima is celebrated all over the world with great excitement and grandeur. It lasts for five days after the full moon day (Pournima) of ‘Falgun’ month (12th month of the Hindu calendar). During the festival, a sacred fire made out of dried wood, branches, twigs and dried cow dung, called as “Holi”, is lightened and worshipped. 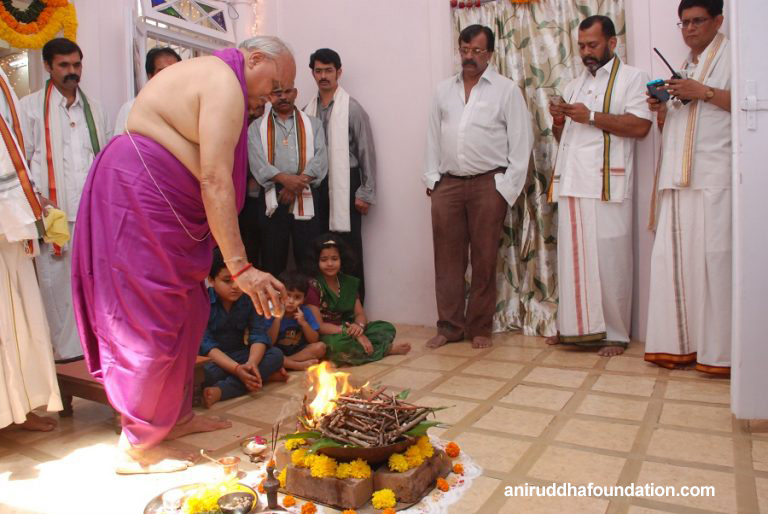 Prayers are offered to Holika Mata to vanquish all the vices within the self. The next day of Holi Pournima is celebrated as ‘Dhulwad’ (celebration with water and colours). Therefore, ‘Holi’ is also known as the ‘Festival of Colours’. The festival of Holi is celebrated at ‘Sai Niwas’, Bandra, with the same zeal and gaiety as in the rest of the country. Sainiwas, is the residence of Govind Raghunath Dabholkar alias Hemadpant, a devotee of Saibaba, who had unwavering faith and trust in Sai. It is at this very place that Hemadpant authored ‘Shree Sai Satcharitra’, which is a treasure trove for all Sai devotees. “Sai Satcharitra not only includes leelas (pastime or divine play) of Sai Baba, who rushed to his devotees, stranding in difficulties but also is an account of those Sai devotees, who had complete and unshakeable faith in him and were able to obtain his grace,” Bapu had said so on many occasions. Interestingly, the story explaining the Holi Pournima Utsav’s origin in Sai Niwas appears briefly in the 40th Chapter of Sai Satcharitra. 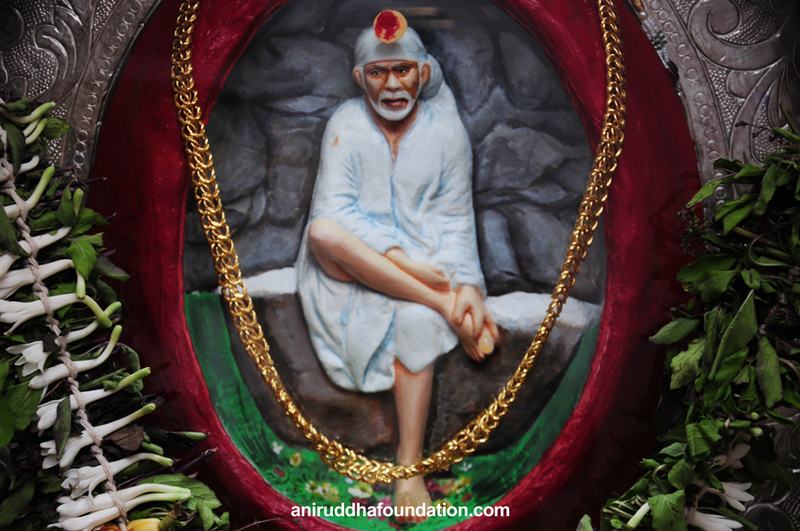 The story dates back to when Sai Baba was still alive in Shirdi, in the year 1917. Hemadpant had a vision at the dawn of Holi Pournima. Sai Baba appeared to him in his dream in the form of an ascetic and told him that he would come to his place for a meal that day. The dream ended after this conversation. He, however, was able to recollect each word uttered in the dream after he woke up. Hemadpant had shared a close association with Sai Baba for seven years. He had complete faith in Sai Baba’s words. It was his sheer belief that if Baba said he would come, he certainly will! In fact, he had decided to accept and consider anyone who showed up during the meal as Sai Baba. Keeping this in mind, he asked his wife to cook food for one more guest. Hemadpant was eagerly waiting for Sai Baba. It was almost time for lunch. Food was ready and was served on banana leaves. He had his eyes fixed on the door. Just then, footsteps on the stairs were distinctly heard. The duo, ‘Ali Mohammad’ and ‘Ismu Mujawar’ had arrived with a portrait of Sai Baba with them. Hemadpant was thrilled after seeing this portrait. He was much moved, his heart swelled with joy and emotions after experiencing Sai’s leelas (divine play). Since then, every year, the festival of Holi is celebrated in Sai Niwas to commemorate the arrival of Sainath, in the form of a portrait. Sadguru Aniruddha has said that it is very important for every Shraddhavan to bow down or pay obeisance to that portrait of Sai Baba on the auspicious day of ‘Holi Pournima’. 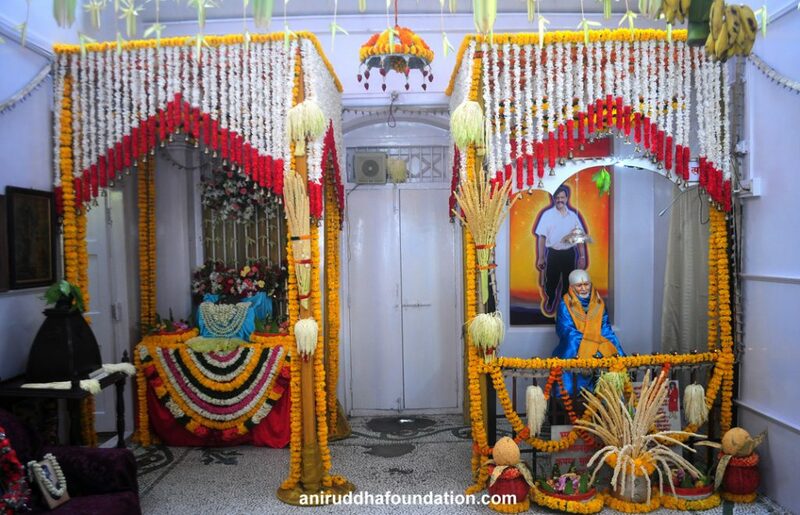 1997 onwards, many devotional programmes were initiated in Sai Niwas under the guidance of Sadguru Shree Aniruddha. 1. The Holi celebration begins two days before the ‘Holi Pournima’, with the recital of Shree Sai Satcharitra. “Dikshit, Shyama, Hemad, Bayjabai, Nana, Ganu, Meghashyam. 3. On this occasion, old flag with ‘Om Sairam’ inscribed on it is replaced with the new one, followed by its worship. 4. The original portrait of Sai Baba, too, is duly worshipped. 6. On the day of the festival, the Dabholkar family members start the chanting of the mantra ‘Om Sai Shivay | Sai Ramaya | Sai Krishnay Namah |’ ’by applying ‘Abeer’ or ‘Bukka’ on the foreheads of each other. Later, all the Shraddhavans who come to seek blessings, chant this mantra repeating the same gesture, i.e. applying ‘Abeer’ to each other. The mantra is chanted throughout the day. 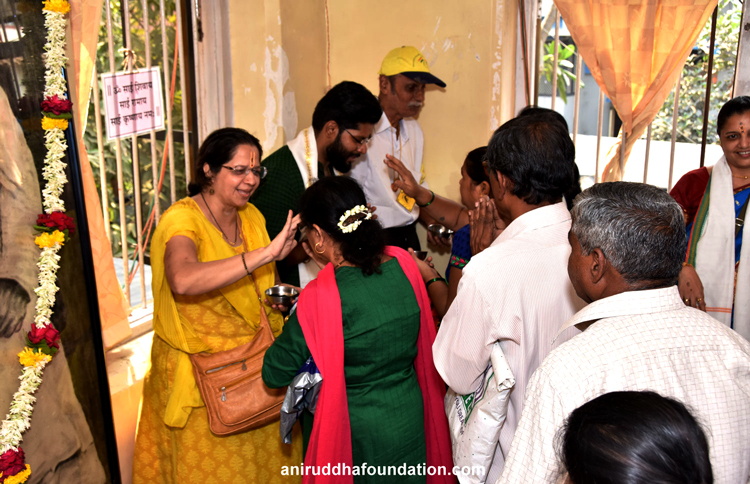 For many years, Sadguru Shree Aniruddha himself used to start the chanting of this mantra by applying ‘Abeer’ to the Dabholkar family members. 7. In the year 1998, an eternal oil lamp was lit in Sai Niwas on ‘Holi Pournima’. It is through the flame of this lamp that Deepshikha is lit, the arrival of which at Shree Harigurugram marks the beginning of the ’Ramnavami Utsav’ Also, Deepshikha is used to ignite the ‘Shri Sairam Sahastrayadnya’. 8. Tulsi Vrindavan is installed on a raised platform in the backyard of Sai Niwas where Shraddhavans can light ‘Sudeep’. 9. Shraddhavans offer ‘Puranpoli’ as prasad. On 11th March 2017, on occasion of the centenary year of the celebration of Holi Pournima, a wonderful program was crucial in Sai Niwas. On this day, as per the guidance of Sadguru Shree Aniruddha, the mantra ‘Om Krupasindhu Shree Sainathay Namah’ was chanted 1,00,008 times from 8 am to 10 pm. During this chanting, Shri Appasaheb Dabholkar and his family were offering Tulsi, and Bel leaves to the original portrait of Sai Baba. All the Shraddhavans too got an opportunity to participate in the chanting. The recital of Shree Sai Satcharitra started on 9 March 2017. Shraddhavans read Chapters 1 to 26 on the first day and Chapters 27 to 52 on 10 March 2017. The ceremony was concluded with the reading of the 53rd chapter of Shree Sai Satcharitra on 11 March. On the occasion of the centenary celebration, ‘Panchmukhi Hanuman Kavach’ on February 12, 2017, and ‘Shiva Panchakshara Stotra’ on February 19, 2017, respectively, were chanted for 108 times. A mere portrait, image or an idol of God is, but his actual existence at the place. Therefore it is important for Shraddhavans to seek blessings of the portrait of Shree Sainath on this auspicious day. It is believed that ‘Sadguru Navratri’ can be celebrated in the place, which has witnessed two different forms of Sadguru. This ‘Navratri’ is celebrated from the first day of the month of ‘Ashwin’ (the 11th month of the Hindu calendar) till Dussehra (the tenth day). This ‘Sadguru Navratri’ was first celebrated in Sai Niwas in the year 1997 under the guidance of Sadguru Shree Aniruddha.